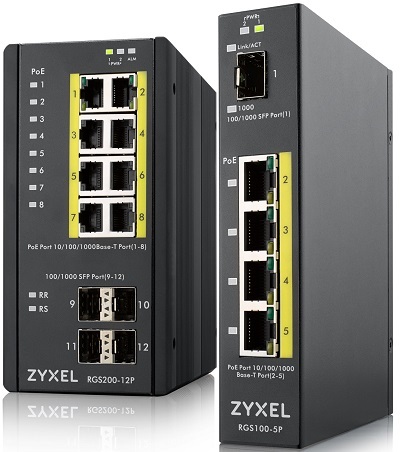 New Delhi, India, November 02, 2016: Zyxel Communications, a global leader in broadband networking technology, announces today the availability of 5/12-port Gigabit Unmanaged/Managed Fanless PoE Switches (the RGS series) designed for stringent and harsh outdoor network deployment scenarios. Along with Zyxel’s complete commercial product portfolio that offers customers with total network solutions, the RGS series is tailor-made for outdoor cabinets for IP-based surveillance or harsh environment deployments to stand up to heat, dust, and electromagnetic or surge interferences. The RGS series features a wide operating temperature (-40°C to 75°C), IP30, EMC certifications and a fan-less design that guarantees excellent thermal control and protection. It also offers a diversity of mounting options, whether on a DIN rail or on a wall, so users can make the most of the limited cabinet space. Security is on the loose once an IP surveillance system goes wrong. The RGS series is equipped with dual power inputs to ensure better network stability – if one power source fails, the other will take over to keep your network up and running at all times. Also, the RGS200-12P is engineered with the redundant ring and quick self-recovery technology. This means in the event of any network error, the RGS200-12Pwill restore normal operation in less than 20 milliseconds. For large-area or street surveillance deployments, transmitting data and power over long distances can be a costly nightmare. With the fiber uplink support, the RGS series is able to extend the network to long-distance nodes up to 40 km away. There are also savings on the cable runs thanks to the RGS series’ PoE support, which features PoE+ and a high PoE power budget up to 120W or 240W to accommodate the commonly power-hungry PoE devices with ease. The RGS series offers 2 models: the managed 12-port RGS200-12P and the unmanaged 5-port RGS100-5P. Zyxel has a comprehensive portfolio of managed, smart-managed and unmanaged network switches that powers small to medium-sized businesses, the hospitality, education, and many other verticals around the world with a reliable network.